Please explain all the parts of my eye to me and what they do? What is myopia, or short sightedness? What is hyperopia or long sightedness? Can long sight and astigmatism be corrected? Is laser eye surgery suitable for patients over 40 years old? Will my eyes look different after surgery? What happens if I close my eye during the surgery? Is there any risk of under or over correction? Does the result remain stable? And if so, for how long? Is it possible to operate both eyes at once? How soon after surgery am I able to see? Can eyes be re-operated? Is there a charge for this? What can I expect before, during and after the operation? How long is necessary to wait for surgery? Can I avoid ever needing reading glasses as I age? What is ReLEx SMILE 3D? What does ReLEx SMILE mean? Do you offer Wavefront Technology? What is an ablation profile? What are the advantages of FemtoLasik 6D? Please explain all the parts of my eye to me and how they work? Here is a very simple diagram showing the key parts of your eye. The Cornea is the clear front window of the eye that transmits and focuses light into the eye. Laser eye surgery corrects irregularities in the shape of the cornea which result in unclear vision. 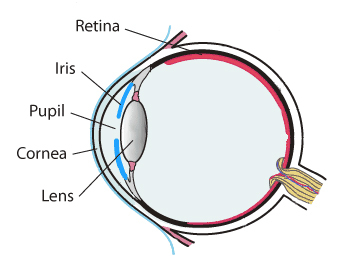 The Lens is the transparent structure inside the eye that focuses light rays onto the retina. It is the “adjustable” part of our eye system which allows us to focus on objects near or far. As we age, the lens loses some elasticity and our ability to focus on near objects decreases. In a healthy, sharp-sighted eye, light rays pass through the cornea and lens, which concentrate them in a sharp focal point on the retina. Photosensitive cells in the retina transform the light signal into electrical impulses and these are passed through the optic nerve to the brain. The brain "translates” this electrical signal into an image that we perceive as vision. The eye, in fact, operates exactly like a digital camera, but the image is not formed on a display, but in our brain. all candidates must be well informed about all aspects of the procedure and have realistic expectations regarding what can be achieved in their case. If the optical size of the cornea and lens matches the length of the eye from cornea to retina, vision is excellent! In many eyes, however, such a balance is missing and the results is what we call a refractive error. With the myopic or short sighted eye, the rays converge in front of the retina; with a long-sighted one, behind the retina and with astigmatism, in two different locations. This is shown on your prescription as a negative number in the box labelled SPH. It is caused by too steep a curve in your cornea relative to the length of your eye. Close objects are seen clearly, but distant ones appear blurry. Laser surgery of myopia is recommended for the range from -0.5 to -12.0 diopters of refractive error. This is shown on your prescription as a positive number in the box labelled SPH. It is caused by too flat a curve in your cornea relative to the length of your eye. Distant objects are seen clearly, but close ones appear blurry. Laser surgery of long sightedness is recommended for the range from +1.0 to +6.0 diopters of refractive error. The surface of the cornea is not round. A perfect cornea should be like a football whereas an astigmatic one is more like a rugby ball! This multiple curvature i.e. steeper in one plane than another causes convergence of light rays in multiple places on the retina. Therefore, vision is blurred or double at all distances. If the astigmatism is not irregular, there is no operating restriction, although usually it is ± 7.0 diopters of refractive error. Yes, of course. Our new laser is certified for astigmatism up to ± 6 diopters and hyperopia (long sightedness) up to +6 diopters. It achieves better results than the older generation lasers thanks to a new surgical option which enables us to individually correct the kappa angle. This is significant for farsighted people. Myopia (short sightedness) and astigmatism can be operated with any of our three surgical methods and we will recommend the best for your particular case. However, our preferred method for hyperopia (long sightedness) is our Z-LASIK 6D procedure. NO - the operation does not hurt - your eyes are anaesthetised with drops. We also give you a slight sedative prior to the operation to help you feel relaxed. During the procedure, you will feel the gentle touches of the surgeon's hands around your eyes whilst they talk you through each step. Discomfort after surgery depends on the individual, and on the operating method. LASIK has very little post-operative discomfort - a slight scratchiness for a couple of hours, and ReLex SMILE almost none at all. Importantly, with our new laser the eye surface is after surgery softer - more "polished“ and smooth. Therefore healing is faster even with the PRK/ ASA 6D procedure where the surface of the cornea is removed. To anyone looking into your eyes, there will be no traces of the operation. Even during an eye examination an experienced ophthalmologist may miss the microscopic traces. The position of the eye during the operation is monitored five hundred times per second by the special Eye Tracking System. Therefore, even if you move your eye, the laser hits the correct place. For large movements, the laser automatically stops and remains motionless until the eye is in the correct position. Your cornea is completely anaesthetised prior to the operation, and this eliminates the desire to blink. In addition to this, we use a special instrument to gently hold your eyelids in the open position. There is no discomfort using this system at all. Not every eye reacts to the laser surgery in the same way, and very rarely the result is a slight under or over correction. Such deviations are extremely rare and can be easily corrected with a follow-up surgery. After FemtoLASIK 6D and ReLEx SMILE, your vision will be excellent in just a few hours. In the first few days after surgery it will continue to sharpen, but may still fluctuate very slightly. However, after three months, the results will be stable and permanent. Any changes after this point would be highly unusual. If this happens, get in touch immediately, and we will diagnose the cause. If a safe and reliable solution is another laser correction, our patients receive it free of charge under our quality guarantee. Patients older than 40 years, however, must be prepared to need reading glasses in the next few years - see below. With the LASIK or ReLex SMILE procedure, you can return immediately. With LASEK or PRK, three to five days rest is recommended. Settling of the final visual acuity generally occurs in several weeks depending on the strength of correction required. The entire process from preparation, through the actual operation to post-operative examination takes 60-90 minutes. You will only spend around 10-15 minutes in the operating room, and the laser operation itself only lasts 10-25 seconds, depending on your prescription. Typically, your vision is good only hours after FemtoLASIK 6D or ReLEx SMILE surgery. The healing period is much shorter than with other surgical techniques. The vast majority of our patients return to work the day after surgery. ReLex SMILE surgery eliminates the cause of almost all complications associated with LASIK - the creation of the corneal flap. ReLex SMILE does not require creation of this flap, hence no complications! However, LASIK and PRK/ ASA laser surgery, like any other medical service, is associated with certain risks and possible complications, such as: dry eyes, inflammation in the postoperative period, fluctuating visual acuity in the immediate postoperative period, reduced visual acuity at night, repeated increase in prescription after a certain time, etc. In general, the better the laser system and the more experienced the surgeon, the lower the risk of complications. Please note, however, that LASIK is a hugely mature procedure with over 30 million cases operated worldwide and an excellent safety profile. We believe that our huge experience of having operated over 20,000 patients, together with our quality guarantee of your surgery, should give you peace of mind in choosing Oftum. With the introduction of ReLE SMILE, Oftum is proud to offer all three types of Laser Eye Surgery - PRK, LASIK and now ReLEx. Each is unique and we will recommend the right procedure for the best and safest visual outcome for YOU. Yes, they can be, even repeatedly. If we have already operated on you, you have our quality guarantee. Therefore, any subsequent adjustment operations will be free of charge. Please refer to Trip Description for a concise outline of your journey with us. There are virtually no waiting periods. We operate each week and any waiting time needed is just to discontinue the use of your contact lenses two weeks prior to surgery. The initial examination and the operation itself can be performed simultaneously in one day. As soon as your vision allows! This is usually after removal of the therapeutic contact lenses - for LASIK and ReLex SMILE this is the following day, and for PRK and LASEK procedures, after 5 days. However, you must avoid rubbing your eyes and thus making contact with the cornea. At some point in our lives, usually after our forties, the ability of the lens in the human eye to focus on near objects decreases and reading glasses become a necessity. The diopter value increases by about 0.50 diopters every 5 years. This condition is called presbyopia or more bluntly – old-age longsightedness. Laser eye surgery or any other surgery is currently unable to stop the lens aging, restore its function fully or permanently replace it. One of the compromise solutions is called monovision, when the dominant eye is corrected out to distance and the non-dominant one to near, but the difference cannot be greater than 2.00 diopters. Once this threshold is reached, reading glasses become unavoidable. Please get in touch with us for advice about your particular case. In the LASIK procedure, a 0.1mm thick flap is separated from the surface of the cornea using a Femtosecond Laser. It is pivoted aside, and the exposed corneal surface is reshaped to correct your vision using an Excimer Laser. The corneal flap is replaced to its original position to enable fast post-operative healing. The procedure is painless although slight discomfort akin to a slight scratchiness may be felt for a couple of hours afterward. In the ReLEx SMILE procedure, a tiny lens (the lenticule) is created inside your cornea using a Femtosecond Laser. It is then removed by the surgeons via a tiny keyhole incision to the side of your cornea. It is the first true keyhole surgery for laser vision correction, induced very low trauma to the eye and has extremely fast post-operative healing. The procedure is completely painless. In terms of the outcome, 6 months after surgery, all methods are equivalent! However, ReLEx SMILE and FemtoLASIK 6D operations have a far faster recovery period and far higher patient comfort than PRK. ReLex SMILE carries less risk of dry eye syndrome due to the less invasive approach. With the introduction of ReLex SMILE, Oftum is proud to offer all three types of Laser Eye Surgery - PRK, LASIK and now ReLEx. Each is unique and we will recommend the right procedure for the best and safest visual outcome for YOU. The Wavefront System is an instrument that takes a 3D image of your eye, creating a “map” of your eye that is as unique as your fingerprint. This data enables us to define surface irregularities and variations that determine up to 200 different prescription points on your eye. This data is downloaded into the laser, which uses the data to correct each of these 200 prescription points, giving you a completely personalized, customized treatment for your eyes. All of our operations feature fully customised ablation profiles mapped to each patient’s individual parameters. We do not offer Wavefront as an option - it is standard practice for us - another part of our commitment to giving our patients the very best outcome possible. An ablation profile is the data required by the laser to make the correct changes to the curvature of your cornea to perfect your vision. Wavefront optimised ablation profiles not only account for the combination of your prescription and the unique attributes of your cornea, but also address the spherical distortions that may induce glare and affect night vision. It results in the best possible vision during both night and day. A femtosecond laser produces ultra short pulses of invisible light. They last only an unbelievable 0.000 000 000 000 001 second and the VISUMAX 500kHz laser places up to 5,000,000 such pulses in the cornea per second. During the FemtoLASIK 6D procedure this is used to gently separate the surface layer of the cornea, and allows refractive errors to be safely and accurately corrected inside the cornea using the Excimer Laser. However, during the ReLEx SMILE 3D procedure, we exploit the unique VISUMAX 500kHz Femtosecond Laser’s ability to work in 3 dimensions. We are able to outline the corrective lenticule WITHIN the tissue of the cornea, thus eliminating the need to create a corneal flap entirely. The VISUMAX 500kHz Femtosecond Laser has made corrective laser eye surgery a minimally invasive keyhole procedure. An excimer laser produces a beam that removes a microscopic amount of corneal tissue in a precisely calculated position, thereby reshaping the cornea and correcting your vision. The EX500 Excimer Laser from the German manufacturer Wavelight AG is currently the best-selling excimer laser in the world. It has an FDA certificate for all dioptric errors. It is equipped with the Eye Tracker system which tracks the position of the eye 500 times per second. The system compensates for any small eye movements and ensures that each laser pulse falls exactly where it is needed to correct your vision. The Femtolasik 6D (Lasik 6D: Laser Assisted in SItu Keratomelusis) is the most advanced LASIK method of laser refractive surgery available today. It corrects nearsightedness , farsightedness and astigmatism using a new generation of Femtosecond and Excimer Lasers . It is a two-phase procedure. In the first phase, the Femtosecond Laser separates a 0.1mm thick flap on the surface of the cornea. It is pivoted aside, saving this sensitive surface layer. The Visumax 500kHz Femtosecond Laser from the Germany - Carl Zeiss is up to 100 times faster than any other system, and uses 90% less power per pulse. It therefore has no inflammatory side effects on corneal tissue. In the second phase, the Excimer Laser changes the curvature of the cornea, thereby correcting your vision. The thin surface layer of the cornea is flipped back into position. The whole operation takes only a few minutes. The FemtoLasik 6D method is the fastest, finest and most accurate LASIK surgery available today. The entire operation is BLADELESS. The whole operation is performed by a laser beam - the most accurate tool available to medicine. The patient feels no pain during or after the surgery, because the correction is made in the cornea and the most sensitive outer layer remains intact. The Visumax 500kHz Femtosecond Laser produces none of the complications that accompany other femtosecond lasers because it is up to 100 times faster and uses 90% less power. It affects the absolute minimum amount of corneal tissue and has no inflammatory side affects. Clear vision is achieved within a few hours of operation. You can pay by bank transfer, credit card or cash.